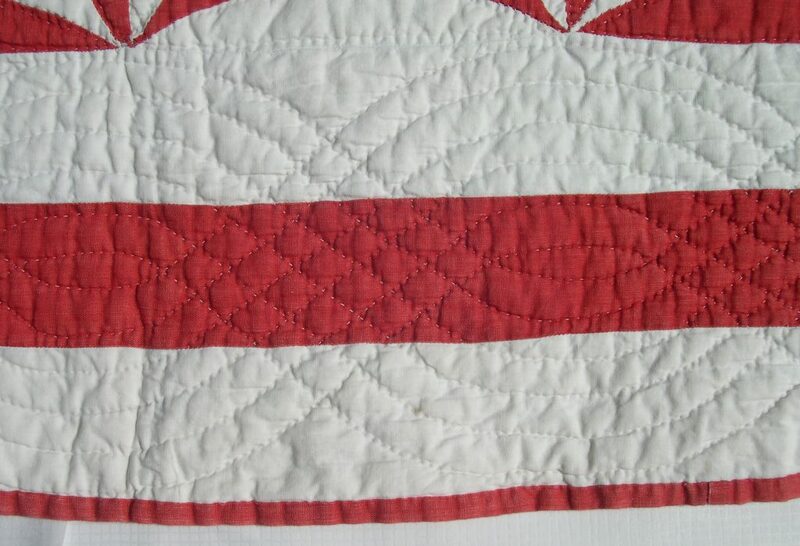 This single bed quilt is made to a traditional patchwork design known as “Rob Peter to Pay Paul”. 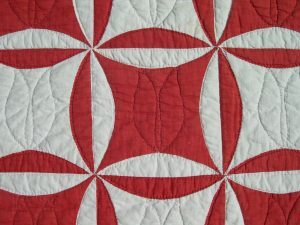 The striking combination of plain red and white fabrics in patchwork became very popular from the mid-nineteenth to early twentieth century, following the widespread introduction of the fast Turkey red dyeing process, so it is thought to date from this period. Measuring 81” x 68” (206cm x 173cm), it is made up of blocks which measure between 6 ½” and 6 ¾” square. There are eight blocks across the width of the quilt, and ten blocks going down. The patchwork design is made up of equal quantities of the two fabrics, and is one of a number of designs, mostly with curved seams, known as “Rob(bing) Peter to Pay Paul” in both the UK and USA. These are created by replacing segments of one colour with those of the alternating colour from the neighbouring block – hence the name. 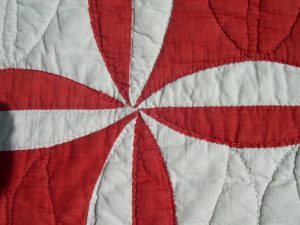 This particular version, where the block is made by drawing an arc from corner to adjacent corner along each of the four sides of a square, can also be found under the name of Pincushion, or in America as Dolly Madison’s Workbox. The arcs are not in fact quarter circles, but are a little flatter, which makes the curves easier to piece. Other curved blocks often seen with this counterchange treatment are Steeplechase, Orange Peel, Winding Ways and Drunkards Path. 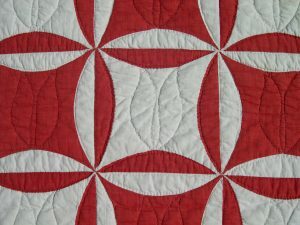 Although American quilts undoubtedly influenced the popularity of the block layout within the UK from the late nineteenth century onwards, simple block patterns have been identified here on quilts dating from earlier than this, and continued to be used right through to the First World War joined side-by-side to make a continuous design. Averil Colby includes a similar quilt dated c. 1870 as Plate 159 of her book “Patchwork”. 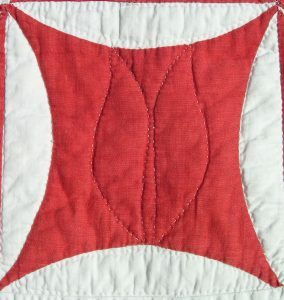 The curved seams on the quilt are hand-pieced with a small running stitch. The maker has risen well to the challenge of making the 12 seams meet to create neat points at the block corners, but on close inspection, a little fudging has occasionally been necessary. 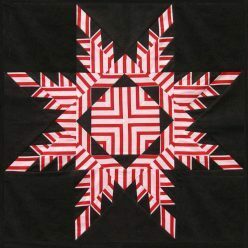 The central patchwork section is surrounded by three borders, each about 2 ¼” wide, alternating between white and red; and the outer edge is bound with red, single-fold, straight-grain binding. The blocks and borders are joined together by machine. 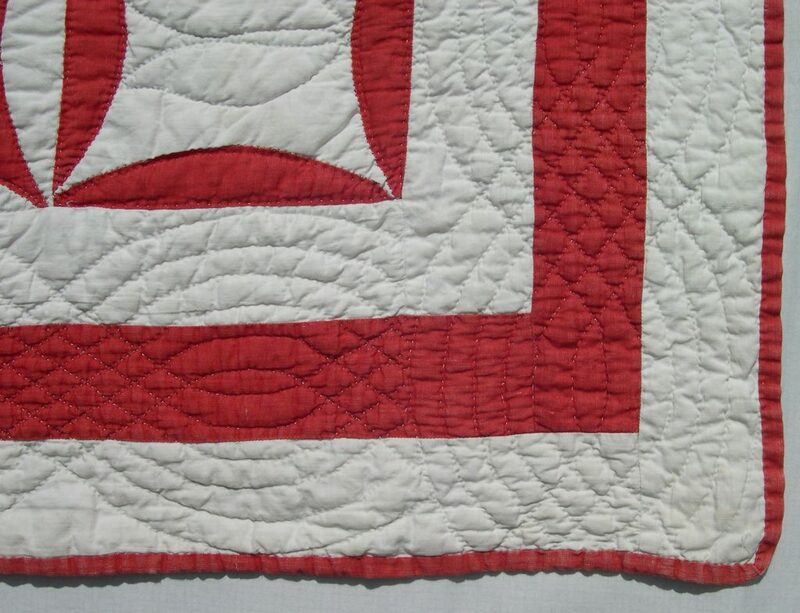 The quilting is all stitched by hand, mostly in small, even stitches, but for a few blocks nearer the edge, the stitching is much coarser and more uneven. Possibly a child was allowed to practice on a section less visible when the quilt was on the bed? 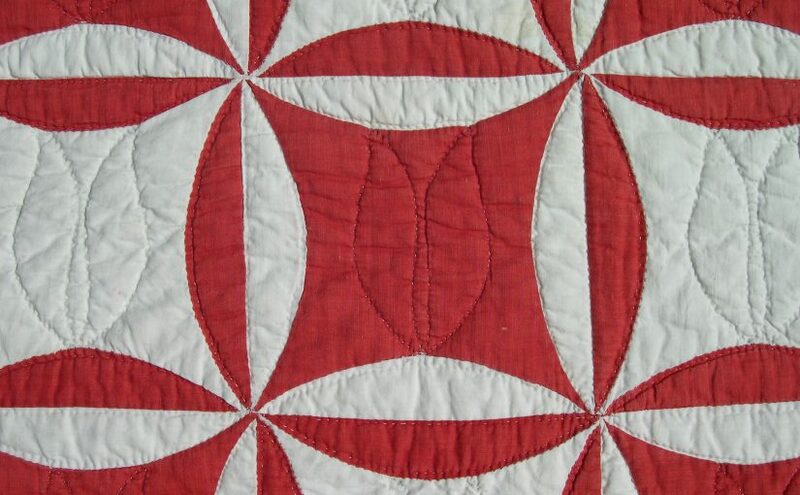 Every half-melon segment is outline quilted, and each block has a simple tulip motif quilted at its centre. These are orientated to face in from the sides, and hence the direction reverses down the centre. A wide, multi-strand cable is stitched across all three borders – the cable goes straight across the top and bottom to the edge, with no attempt to make it flow around the corners. 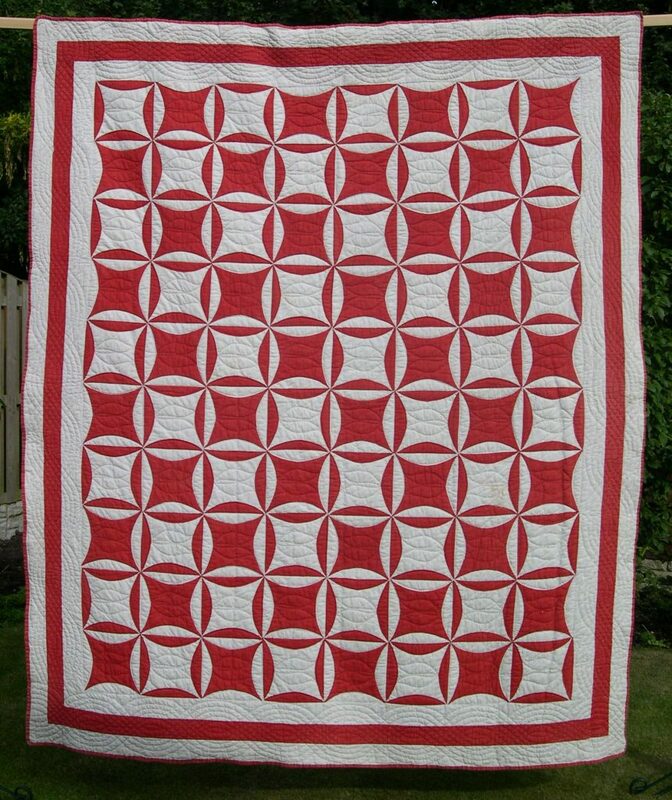 This quilt is made from red and white cotton fabrics, backed with white cotton of a slightly looser weave, and filled with cotton wadding. It is generally in good condition, with some damage to two areas of white fabric; one on a block centre, and one on a nearby border. It was bought from an antique shop in Wirksworth, Derbyshire, but unfortunately no provenance was available. 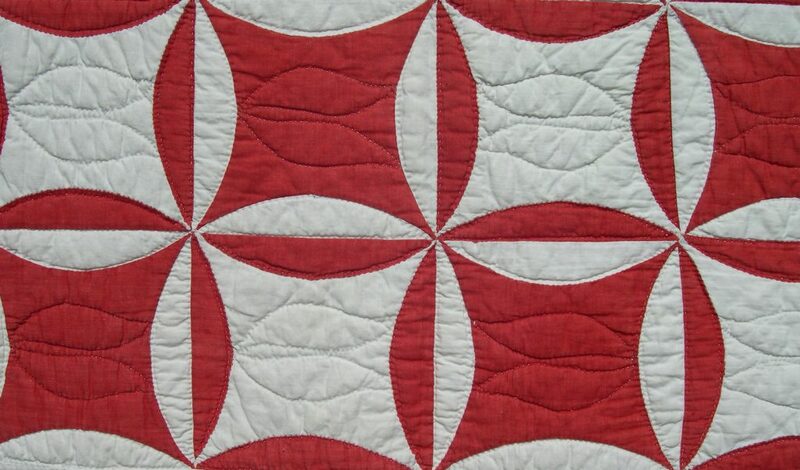 To be notified when more antique quilts are posted, why not sign up for my Newsletter?